The second largest Rhône appellation, just behind the Côte du Rhône appellation, is for wines from the group of villages in the southern Rhône that do not have their own appellation (such as Gigondas). There are a bit less then 10,000 hectares of vineyards and the wines are divided up between those who can simple use the word “Villages” on the label and the 17 villages who can append the name of the village to the label (such as Plan de Dieu). A large variety of Rhône grapes can be used for the wines but most often the reds are made from Grenache with Syrah and Mourvèdre and the whites from Grenache Blanc, Marsanne and Roussanne. There are a great variety of soils in the area but the best-known feature is the pebbles (or galets) that are found in the ancient glacial soils. The climate is Mediterranean with a strong influence from the Mistral wind. This is a large area covering 95 communes in the departments of the Vaucluse, the Gard, the Ardèche and the Drôme. The red wines are full-bodied and spicy with rich, earthy flavours that go well with game, stews and casseroles. The white wines are generous and aromatic with aromas of peach, honeysuckle and blossom. They match well with shellfish, baked fish in cream sauce and blue cheese and goats’ cheese. These wines can be enjoyed quite young and for up to 5-10 years after their vintage. Made from the classic GSM blend (Grenache, Syrah and Mourvèdre), this wine opens with a very beautiful nose of ripe berry fruit, spice and tobacco underpinned with a lovely floral element of almond and peach blossom. On the palate the wine is generous, fresh and well-balanced with notes of plums, stones and wild herbs. There is a lively, fruity finish to this well-made wine from an excellent vintage. 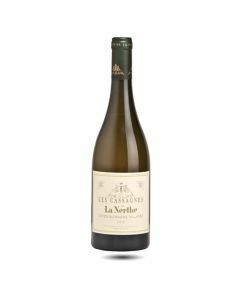 A beautiful rich and satisfying white Rhône with an abiding freshness which makes the wine more elegant and livelier on the palate. Made from a blend of Viognier, Grenache Blanc et Roussanne cultivated organically, this is a deeply satisfying wine with an expressive nose of lemons, melons and grapefruit, generous and round on the palate with ripe, sweet fruit lifted by good acidity and bite. The finish is silky and long with very persistent fruit flavours in the finish. There is less Viognier in the blend this year and such is the demand for this wine that the estate is doubling the surface of white grapes planted at Cassagnes. Les Cassagnes de La Nerthe Rouge 2015 (bio) 60% Grenache Noir, 30% Syrah, 10% Mourvèdre grapes are used in this exciting, organic Côtes du Rhône which replaces the former Domaine Renjarde wine. Made by the same, ambitious winemakers, the Cassagnes comes from a forty year old vineyard planted on limestone and sandstone. The wine is aged in large oak vats to keep the primary freshness of the fruit: plums, blackberries, bing cherries and sloes are the aromas that are conjured up here without being jammy or too sweet. On the palate the purity of the fruit is evident with some spicy notes of freshly crushed black pepper, cloves and lingering notes of liquorice and lavender on the finish. 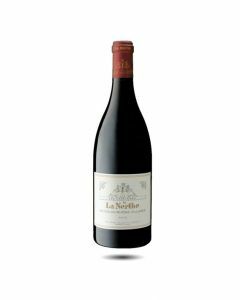 A lovely wine, perfectly balanced between richness and freshness and full of spicy Rhône flavours. Very easy to drink now this wine will âge well for 5-10 years and matches well with game dishes, stews, roast meats and barbecues. This youthful fresh wine is very expressive and approchable, with aromas over 60 ye of roses, peach, honeysuckle and wild flowers. It has excellent fruit flavours and is beautifully balanced and soft without losing any of its aromatic complexity. The wine comes from old Grenache, Syrah and Mourvèdre vines grown in deep limestone soils from a vineyard in Serignan-du-Comtat, north of Orange and Avignon. The wine is fermented and aged in concrete and stainless steel vats. Lovely to drink now with great freshness and silkiness, this is an easy drinking wine with lots of spicy, fruity flavours to serve with grilled meats, pizza and Asian dishes.